Exams are finally over and I have some free time again. I have an enormous backlog of recipes to write up and it just keeps getting bigger — I didn’t stop cooking, I just stopped blogging about it! I do have, however, some utterly delicious recipes to share with you all, and now I have more time I will be able to get back into cooking a bit more too. 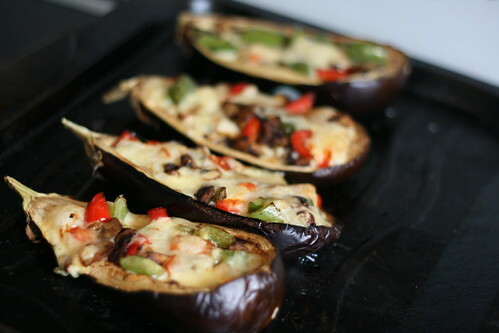 So, this recipe is for stuffed aubergines. I found this in the May 2011 edition of the BBC Good Food magazine, and I just adapted it a little to make it friendly for our house. This means it’s free on Slimming World and uses peppers rather than tomatoes (we hate tomatoes), but if you make it with the tomatoes instead send me a picture because I bet it tastes fabulous. This takes very little preparation time too, as most of the time spent cooking it is waiting for it to bake. You could have it as a light lunch, or as a part of a main meal (which is what I did). But however you have it, it’s absolutely scrummy. Pre-heat the oven to 220c and prep the veg. 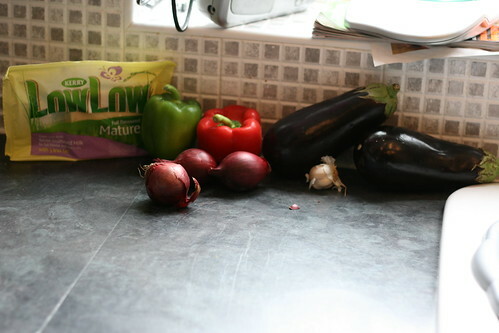 Finely chop the onion, finely chop or crush the garlic and cube the peppers/half the tomatoes and chop the olives. 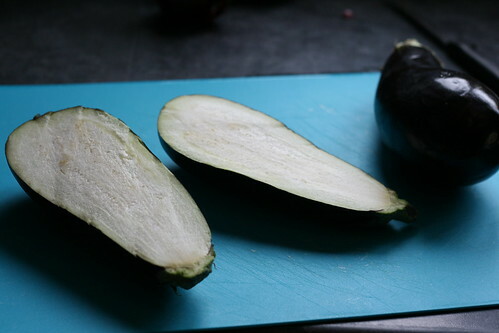 Then use a knife to cut a border inside each aubergine, about 0.5-1cm thick. Then use a teaspoon to scoop out the flesh. I’m sure there’s a better way to do this than I did it — I made a total mess. Any suggestions, feel free to drop me a comment. 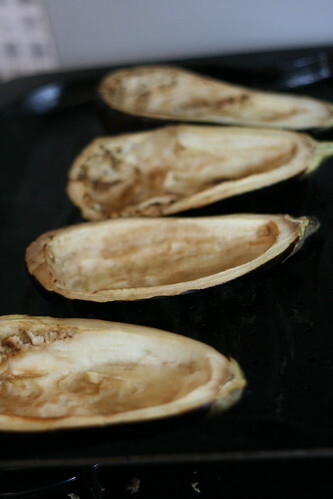 You should end up with four aubergine shells. Spray these with Fry Light, add a little black pepper and cover the whole tray with foil. The bake for about 20 minutes. 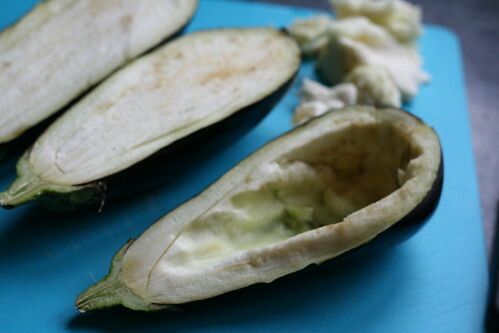 Whilst they’re baking, chop the aubergine flesh. 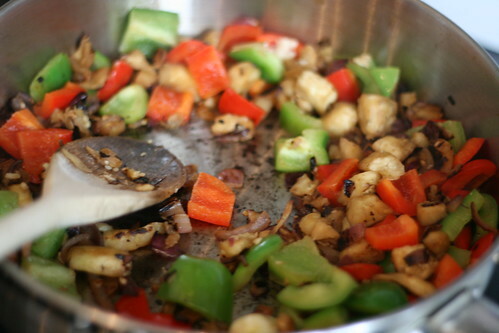 Then spray a large frying pan with Fry Light and cook the onion until soft. Add the chopped aubergine flesh and cook through, then add the garlic and peppers/tomatoes and olives. You should end up with a good amount of filling. 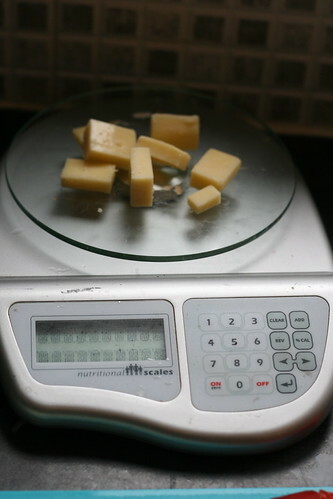 Then measure out your cheese. You want 28g per person (or 42g if you’re using low-fat cheese). I cut mine into chunks when I’d measured it out to make things easier, but you could grate it as well. Reduce the heat to 200C and start stuffing the shells with the filling. 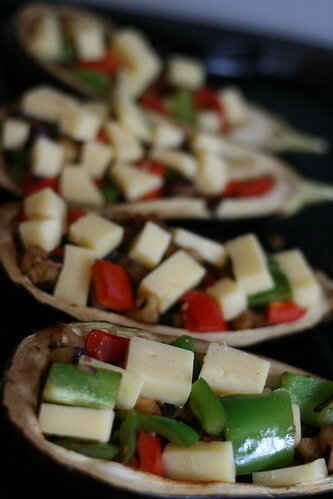 I measured it out as equally as I could in each one, and then nestled the chunks of cheese inside. Some I hid near the bottom, most I put on the top. Spray with a little more Fry Light and bake for another 15-20 minutes, until the cheese has melted. I served mine with steak. 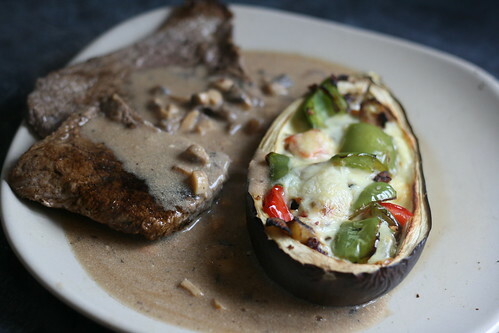 To be honest, next time I might just have the aubergine and some salad; it’s more than filling enough. Few more photos here, and as always let me know if you try it! I made this and it was wonderful!